An archiving system from Southampton-based data-entry specialist Kendata Peripherals has enabled West Lothian Doctors' Co-operative (Westdoc) to make savings in its document storage costs, as well as freeing up a substantial amount of space in its administration department. Providing out-of-hours coverage for 24 West Lothian general practices, Westdoc receives around 41,000 telephone calls per year, each of which is assigned a unique call number by the co-operative's Knight Owl system. During each call, the Westdoc receptionist takes the patient's details and a basic summary of their symptoms. This information is then printed out on a single-sided A4 call sheet and passed to a Westdoc doctor, who speaks to the caller and decides on the best course of action - whether it be telephone advice, a visit to the Westdoc Primary Care Centre or a home visit. When the patient has been dealt with, the doctor completes the rest of the call sheet, detailing the action that was taken. In common with other doctors' co-operatives, the problem for Westdoc was that the completed call sheets had to be stored indefinitely in case they needed to be referred to at a later date for legal reasons. Administration assistant Debbie Simpson takes up the story: "After we had faxed the call sheets to the general practices, the originals would be boxed up awaiting collection by a document storage company. Although the storage company provided a good service, this became an increasingly costly business as the years went by and the number of call sheets in storage continued to rise. "Also, there would always be several large boxes of recent call sheets cluttering up the relatively limited office space that we have here." Then, early in 2002, Westdoc made contact with Kendata Peripherals and quickly realised the potential benefits of installing a document archiving system. "Although there was an initial outlay on the system, it was obvious that it would save us a lot of money in the long run," continued Debbie, "and you can't put a price on the convenience and simplicity that the system offers." Consisting of a PC, scanner, printer and Kendata's DCAM (Doctors' Co-operatives Archiving Module) software, the system is based on the company's commercial Information Archive Server product, with specially developed input screens to suit the needs of doctors' co-operatives. The result is an intuitive archiving system providing features normally only found on significantly higher priced products. "One of the best things about the system is its simplicity," commented Debbie. "It only takes a few minutes to learn how to use it, so staff don't need any formal training as such. That is especially important for us because we have a lot of different receptionists working on different shifts, and they all need to be able to use it." 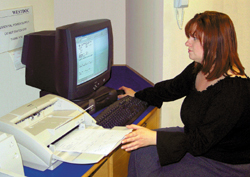 As batches of Westdoc call sheets are scanned, the system's OCR (optical character recognition) facility automatically reads the unique call number at the top of the sheet and allocates it to the image, together with the time and date of scanning - thereby simplifying the retrieval process. Debbie Simpson again: "If we need to retrieve a call sheet, we simply key in the call number and up comes a perfect image of the original form, including any handwritten notes and drawings that the doctor made at the time." Since having the Kendata system installed, Westdoc no longer puts the original call sheets into storage, but instead sends them directly to the general practices. "Nowadays we only need to store electronic images of the call sheets, so we can forward the original documents to the patients' GPs, " said Debbie. "The DCAM system has freed up a significant amount of space for us, as well as reducing our long-term document storage costs."